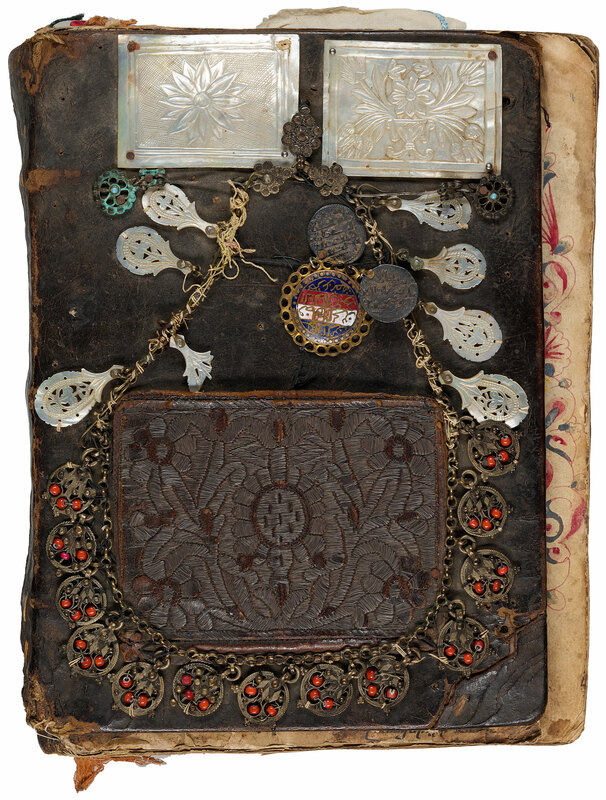 Armenian early 18th century calf binding, with mother-of-pearl plaques on the upper cover, gilt-metal and bead necklace or headdress, a metal-thread embroidered floral panel forming a pocket, two coins, and on the lower cover metal bracelet, a gilt-metal cross, 30 (of 31) seals in Arabic, Armenian and Greek scripts, two earrings and two semi-precious stones. Purchased on the Herzog Fund, 2006. The manuscript has been seen by Stepan Israelian, bishop of Kharput (1866-1915); Emil Offenbacher; purchased by Cornelius J. Hauck on Feb. 23, 1950; bequest to the Cincinnati Historical Society, which became part of the Cincinnati Museum Center in January 1995; sale (London, Christie's, 28 June 2006, lot 169); purchased by the Morgan Library, 2006. Ms. Gospel book; written and illuminated in Eastern Turkey (? ), late 17th century or early 18th century. Texts: Gospels with list of chapters and prologues (fols 1r-74vb, Matthew; fols 75r-121rb, Mark; fols 121v-197rb, Luke; fols 197v-254va, John). Decoration: 4 full-page miniatures (185 x 140 mm, on fol. 3v, 77v, 124v, 199v) and 26 small miniatures in the margins; 4 illuminated incipit pages with arabesque carpets (fols 4r, 78r, 125r, 200r: 135/145 x 130/140 mm); 4 historiated initials with the evangelists' symbols (fols 4r, 78r, 125r, 200r); bird-shaped letters and capital letters, rubrics. Textiles: braided and embroidered ribbon page markers and curtains.